Our passion. Real-world investment solutions. At Devenir, we have a passion for the HSA market with an unparalleled focus on providing real-world solutions and a first-class customer and user experience. Our history and leadership in the industry, coupled with our knowledge and experience serving a variety of organizations, gives Devenir a unique perspective and keen insight into the needs of HSA providers — and their account holders. We partner with some of the largest banks, administrators and technology providers to deliver convenient, cost-effective HSA solutions that increase your value to customers, while giving account holders the power to save for future health care expenses. Our integrated investment platform helps you gather and retain more HSA assets, which gives you a competitive and financial advantage over HSA providers who don’t offer investments. Primary focus: Our main focus is on providing great investment solutions for HSA accounts. Economies of scale: With our experience and size, we can achieve economies of scale with mutual fund companies and eliminate sales loads. Independence: Devenir is employee owned and is completely independent from any HSA provider or custodian. Quicker access to funds: We offer same-day exchanges with next-day settlement, while most competitors offer a two-day settlement. Customers have quicker access to cash to pay for pending claims. Seamless integration: We offer innovative technology platforms that help seamlessly integrate your existing HSA platform with our investment options — typically faster and at lower cost. Build your brand (and not your to-do list): Devenir’s private-label solutions complement your brand, and meet your specific customized investment objectives as well as technology integration requirements. Tap into Devenir’s knowledge and expertise to integrate investments and expand your HSA offerings — and your consumer appeal. Seamlessly integrate our first-class investment offering into your technology solution. Deliver more value to your clients with our turnkey approach to health care spending accounts. Demonstrate your value and deepen relationships with your customers by offering our proven health care benefit investment solutions and resources for account holders. 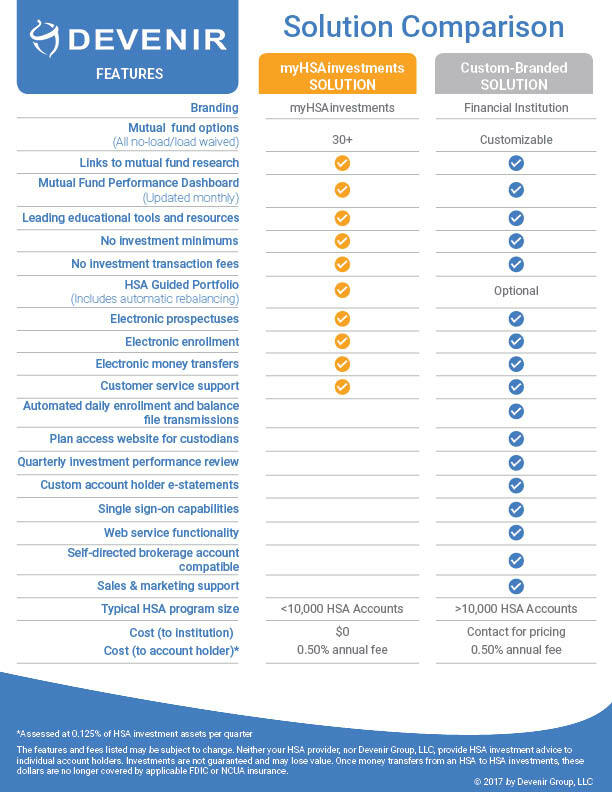 A white-label solution that allows HSA custodians to seamlessly integrate investments into their HSA offering. myHSAinvestments allows account holders to access a suite of mutual fund investment options and tools, without the extensive integration that a custom plan may require. Simply direct your customers to myHSAinvestments where they will find a variety of mutual fund options and tools (including our HSA Guided Portfolio) to confidently invest a portion of their HSA funds. You remain the account custodian, while they have the freedom to manage their own investments. A suite of tools, calculators and information to help HSA account holders make informed decisions about health care spending and savings. HSAs are growing in popularity, but consumers still need education and decision-making support. Devenir offers HSA Planner to meet that need. Account holders benefit from a suite of tools, calculators and educational resources to help them understand their HSA and make the most of their health care dollars. A robust resource to help individuals find the right HSA custodian based on their savings goals. It’s important that individuals find the right HSA provider for their financial needs. HSA Search, from Devenir, simplifies this task by presenting hundreds of HSA custodians and offering detailed information about key features, fees and interest rates. If you are an HSA provider and would like to be added to the HSA Search website, please contact us at info@hsasearch.com.